Providing you the best range of artificial grass for hockey courts with effective & timely delivery. 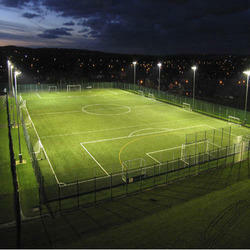 We provide Artificial Grass for Hockey Courts which is widely used in hockey fields. Artificial grass for hockey courts is comparatively made of shorter fibers than those used in football grounds. With the introduction of artificial grass in hockey courts, the speed of the game has increased which has introduced a change in shape of hockey sticks in order to allow different strokes like reverse stick trapping and hitting, which stocks are properly placed in Artificial Grasses. Artificial grass supplied by us for hockey courts gives speed to the sport. It gives room to players to make fast passes with precise ball control. Artificial grass is ideal choice for hockey courts because hockey is a sport of rushes and artificial grass gives enough cushioning to player which relaxes them from getting worried about injuries happening because of sudden slides.